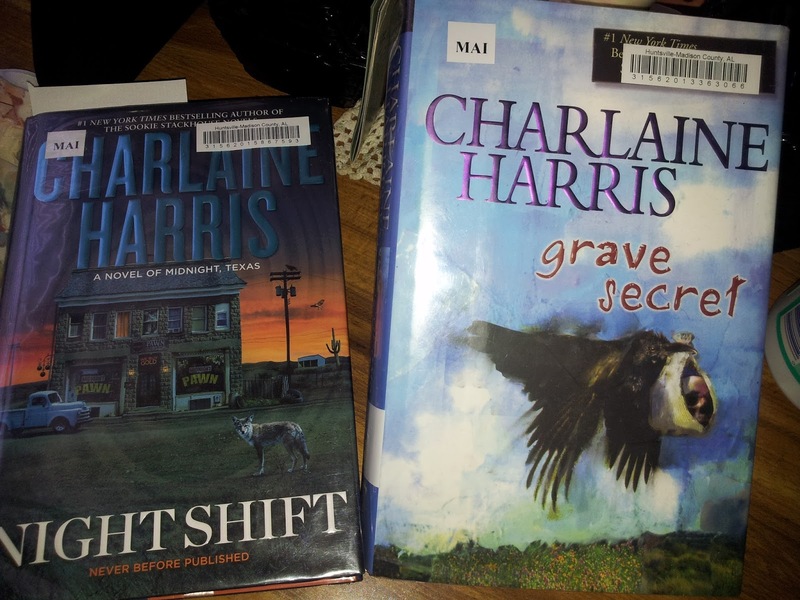 Looks like I’m starting November concluding two of Charlaine Harris’ popular series, via library check-outs. And I’m excited to see how each will end. So first I’m finally going to finish the fourth and final book in Charlaine Harris’ Harper Connelly series. As some of you may or may not know, I finally finished the third book in the series, An Ice Cold Grave, as part of the #SaveOurCozies readathon back in July. It had taken me all of about six years to finally find my way to the book–after reading the first and second back-to-back. Anyhoo. The Harper Connelly mysteries follow a female character of the same name who, crazy enough, has the ability to locate corpses. She survived a lightning strike during her teen years, and this unfolded her abilities. For the past three books she and her partner/stepbrother, Tolliver, traveled to three different small towns to help clients in need of finding a body. And, like a human divining rod, Harper goes to work locating corpses. The problem is some of those still living aren’t too happy to have bodies found, and will do what it takes to keep them buried. But besides all that, there’s a overarching story that revolves around Harper and Tolliver's missing sister. Questions as to whether or not she walked out of the family or was kidnapped by gangsters has been in the air between these two since childhood. Supposedly, that sister’s mysteriously disappearance is coming to an end in this fourth and final book. Another thing–which is a little creepy–though once stepbrother and sister by marriage, Harper and Tolliver finally slept together in the previous book. So will this borderline incestuous relationship work? Anyway, more family matters are coming to a head in Grave Secret. It appears to be a book wrote right on time to close the series out. Charlaine Harris’ latest series consist of a trilogy of books featuring an eccentric and strange Texas town called Midnight. Plenty of unusual residents live within this small community. A murder/burglar, a psychic, a witch, a were-Tiger, and of course a vampire. All among other "things", of course. The first book focused on this band of characters coming together to solve a “human” influenced murder, and subsequent hiding of the body of a particularly once popular resident. The second book spoke about the training of a were-tiger, and a running side story consisting of the characters falling into the push-and-pull of a rundown hotel in the area. But I’ll leave all those details for another day. However, while I swung swiftly through the first book, it took me half a year to finally finish the second book in the series. I eventually made it. With only three books, I figured eventually I’ll give to the final book and close the series out. Which is now with Night Shift. Night Shift has an interesting premise in itself. Apparently, something is causing the residents in the town to walk into the local pawnshop, buy a weapon of choice, and walk outside into the main crossroads of town to… well… commit suicide. And I’m leaving it at that! I’m already ready to go read this suckers instead of talking about them! If you’ve read any of these series, please share with me your thoughts below!